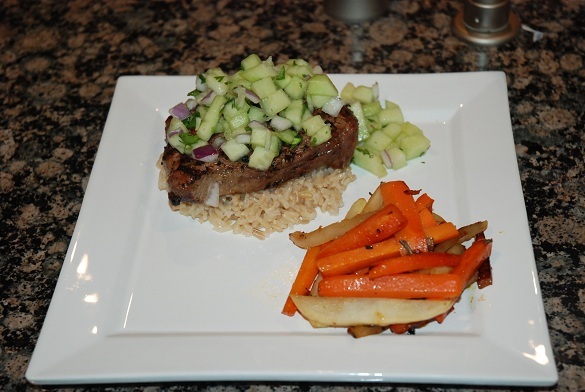 I have a hubby who loves his steak, so every once in a while, i indulge his tastes and put steak on the table! Normally, i shy away from this meat because it tends to be a heavy meal..most often i opt for chicken or turkey. But…. 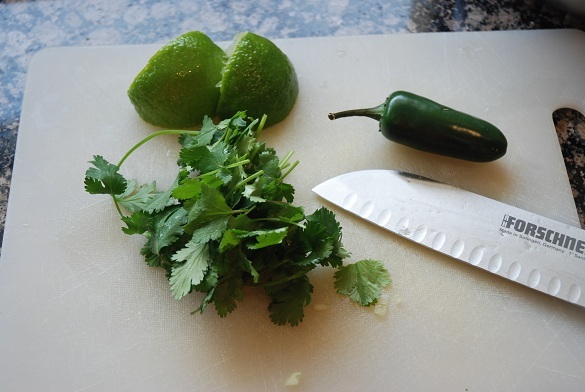 i found this recipe today on Epicurious and wow…SO good! It’s a keeper! Steaks are marinated in a sauce of lime juice, vegetable oil, curry powder, salt and pepper..the longer you let the steak marinate, the better. 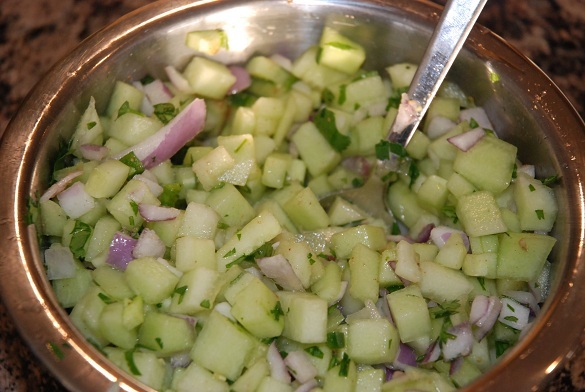 The addition of chopped cucumbers, diced red onion, ground coriander and cumin give this chutney delicious flavor.. Grill your steak on the barbie to the doneness of your liking…my husband tends to think that anything more cooked than medium rare is a crime!! 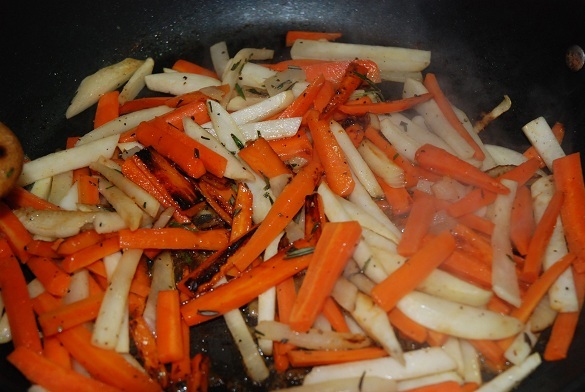 To accompany the steak, i made Sauteed Parsnips and Carrots with Honey and Rosemary Only difference?? My local grocer was out of parsnips, so i substituted turnips. Truthfully, i’ve never been a fan of turnips, but this recipe changed my mind! 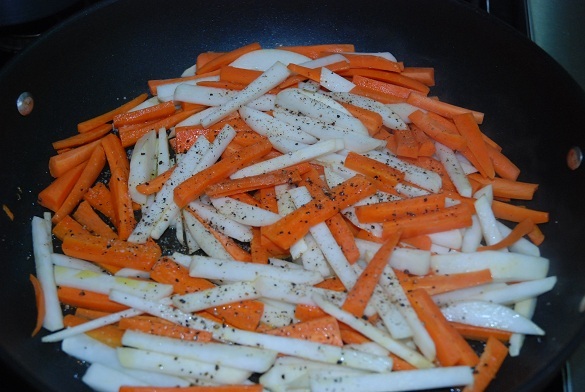 The combination of rosemary and honey with the sauteed carrots and turnips is so-o-o good! 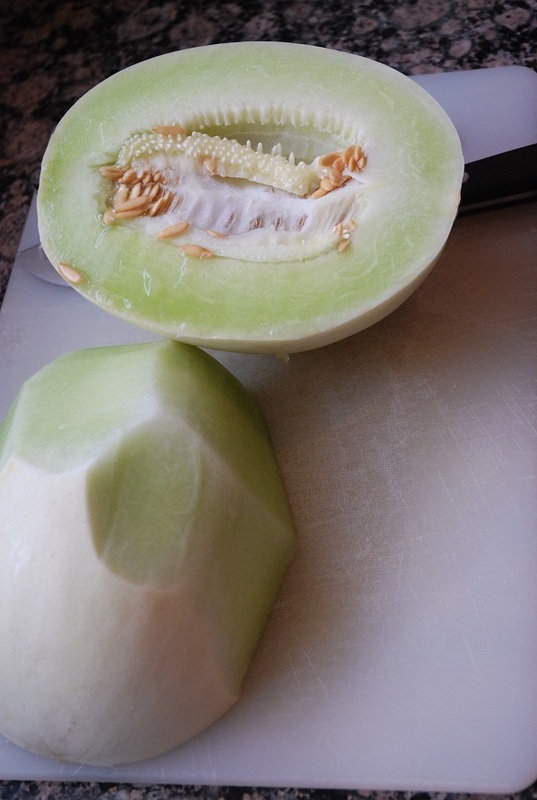 And….it’s quick to prepare..bonus! Chop both the turnips and carrots into thin matchstics and season with kosher salt and pepper. After about 12 minutes, the carrots and turnips are starting to carmelize...add the fresh rosemary and honey. The honey glazes the veggies, adding a hint of sweetness. To finish off the menu, i made some basmati rice… even though i was just serving my family, it’s fun to plate the meal and put some effort into the presentation! 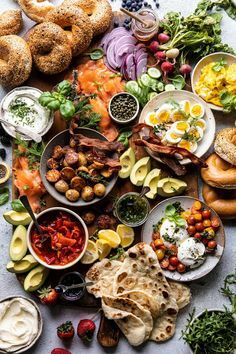 This would also be a great “guests over” meal! Mound some basmati rice on the plate, and lay the steak overtop. Spoon the fresh chutney overtop. Make sure to keep the extra chutney on hand...your family/guests will be wanting second helpings! I love it when my family eats themselves silly over a meal i’ve prepared…and this one was a hit! We all decided that the chutney could be served as a salad in and of itself. So fresh and so flavorful!